I wrote Part 1 of this article before we left Gig Harbor. I was excited, prepped and READY to feed my cruising clan.....best laid plans.....we ate NONE of what I had prepared. Part 2 explains why. 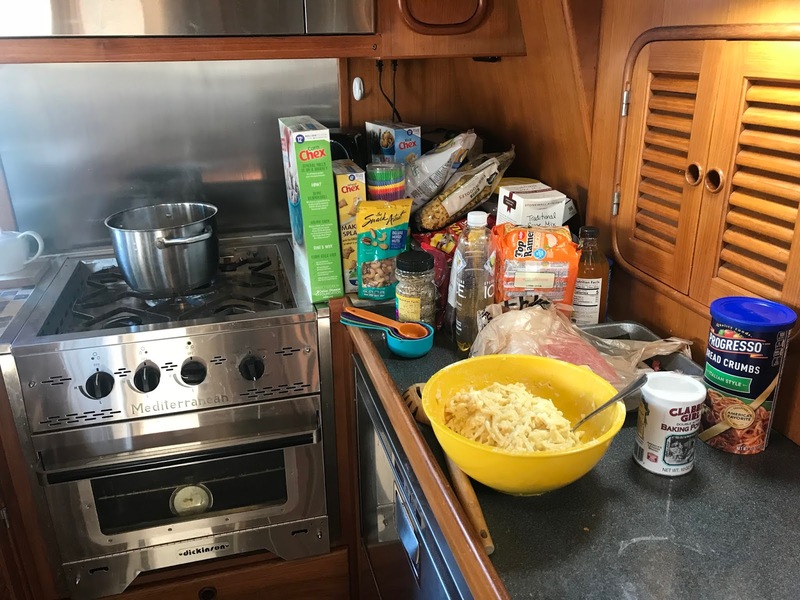 While we have an excellent galley, when underway, no one wants to spend much time in there. So, having learned from our San Juans cruising days, I spent a week prepping all of the food ahead of time, vacuum sealed it and froze it (thanks to Dave's freezer). We will probably show up in San Francisco with a ton of extra food - but I'd rather have too much than not enough! Well, we did have a ton of extra food - in fact - all of it! 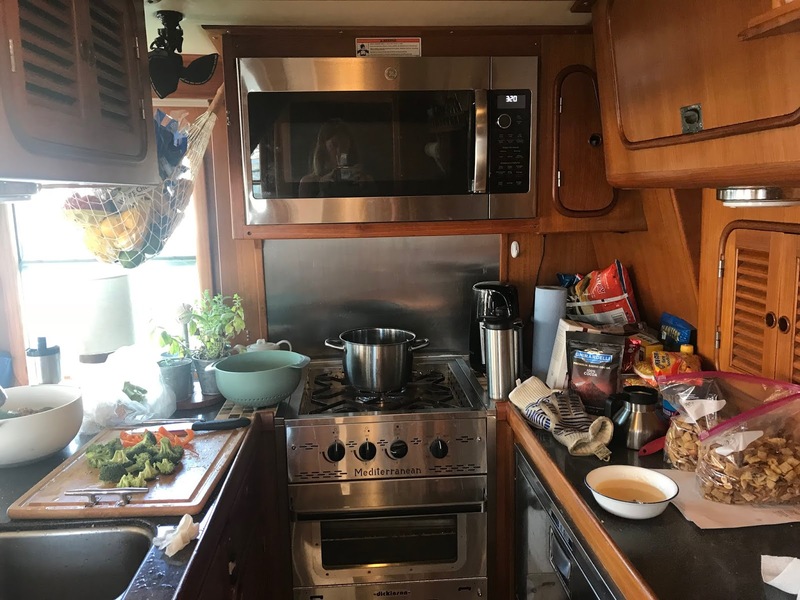 With all of the waves and swells, no one could spend any time in the galley. When we tried to put items in the microwave, they clanked around from side to side, spilling all over. No one was able to mix, heat or chop anything for the entire time we were out at sea. Also, no one was very hungry. Even those who didn't get seasick didn't have an appetite. So what DID we eat? 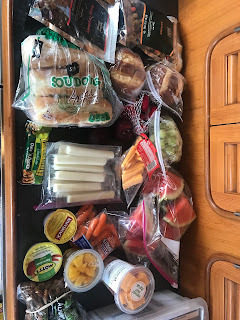 From Neah Bay to Crescent City (3 days) we ate Smartfood, Goldfish crackers, Chex mix, gummy bears, water, gingerale, Gatorade, Red Bull and an occasional coffee (when we could stand long enough to hold the kettle). Great diet. I have no idea why we were so fatigued. Once we recovered from that ordeal, I decided to re-provision the boat in Crescent City. After all, we had 2 more days to go in open water. 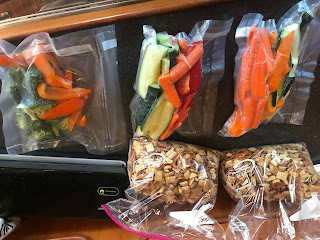 Fruit cups, pre bagged and cut veggies, pre made sandwiches, fruit smoothies, cheese and salami baggies, trail mix, Via instant coffee (yes more Goldfish, Smartfood and Redbull). We even went to a thrift store, bought an old stainless steel thermos so we could heat water up just once and use it for coffee and powdered soups. 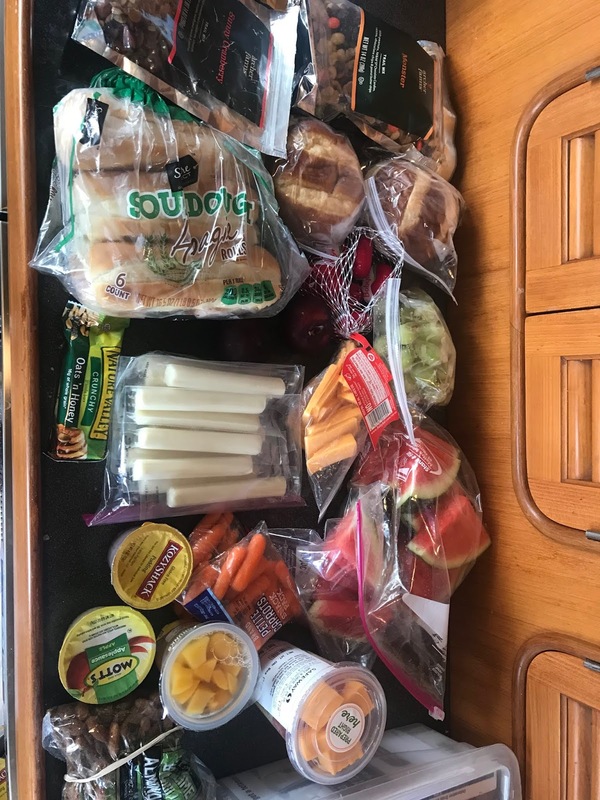 We still didn't have much of an appetite from Crescent City to San Francisco - we still had leftover snacks upon arrival. But this was an easier, healthier system. 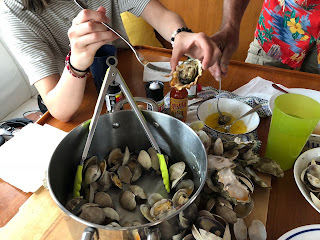 The perk of all of that frozen food, was that when we were at dock finally, we had a LOT of great food options to choose from and didn't have to eat out much.